CCI recognizes that professional development and competency maintenance may be accomplished in a variety of ways, including successful participation in various professional activities. To recertify by points, you are required to earn 300 points within a five year period. You may choose from﻿ eligible activities to earn your points. When you successfully recertify, your credential will be valid for another five years. 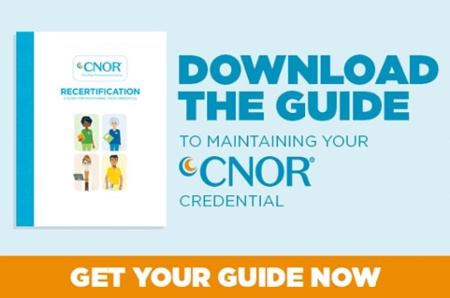 Download our ﻿CNOR Recertification Guide﻿﻿ for more information including our professional activity logs. CNOR recertification by points is available online. If you are due to recertify in 2019, applications will be accepted beginning January 1, 2019. You may submit a Points recertification application through December 31st of the year you are due to recertify.